For other uses, see Hezekiah (disambiguation). Hezekiah (/ˌhɛzɪˈkaɪ.ə/; Hebrew: חִזְקִיָּהוּ)[a] was, according to the Hebrew Bible, the son of Ahaz and the 13th king of Judah. Edwin Thiele concluded that his reign was between c. 715 and 686 BC. He is considered a very righteous king by the author of the Books of Kings. He is also one of the most prominent kings of Judah mentioned in the Bible and is one of the kings mentioned in the genealogy of Jesus in the Gospel of Matthew. According to the Bible, Hezekiah witnessed the destruction of the northern Kingdom of Israel by Sargon's Assyrians in c. 722 BC and was king of Judah during the siege of Jerusalem by Sennacherib in 701 BC. Hezekiah enacted sweeping religious reforms, including a strict mandate for the sole worship of Yahweh and a prohibition on venerating other deities within the Temple of Jerusalem. Isaiah and Micah prophesied during his reign. The name Hezekiah means "Yahweh (Jehovah) Strengthens" in Hebrew. The main account of Hezekiah's reign is found in 2 Kings 18–20, Isaiah 36–39, and 2 Chronicles 29–32 of the Hebrew Bible. Proverbs 25:1 mentions that it is a collection of King Solomon's proverbs that were "copied by the officials of King Hezekiah of Judah". His reign is also referred to in the books of the prophets Isaiah, Jeremiah, Hosea, and Micah. The books of Hosea and Micah record that their prophecies were made during Hezekiah’s reign. Hezekiah was the son of King Ahaz and Abijah. His mother, Abijah (also called Abi), was a daughter of the high priest Zechariah. Based on Thiele's dating, Hezekiah was born in c. 741 BC. He was married to Hephzi-bah. (2 Kings 21:1) He died from natural causes at the age of 54 in c. 687 BC, and was succeeded by his son Manasseh (2 Kings 20:21). According to the Bible, Hezekiah assumed the throne of Judah at the age of 25 and reigned for 29 years (2 Kings 18:2). Some writers[who?] have proposed that Hezekiah served as coregent with his father Ahaz for about 14 years. His sole reign is dated by William F. Albright as 715–687 BC, and by Edwin R. Thiele as 716–687 BC (the last ten years being a co-regency with his son Manasseh). Hezekiah purified and repaired the Temple, purged its idols, and reformed the priesthood. In an effort to abolish idolatry from his kingdom, he destroyed the high places (or bamot) and the "bronze serpent" (or Nehushtan), recorded as being made by Moses, which became objects of idolatrous worship. In place of this, he centralized the worship of God at the Jerusalem Temple. Hezekiah also defeated the Philistines, "as far as Gaza and its territory", (2 Kings 18:8) and resumed the Passover pilgrimage and the tradition of inviting the scattered tribes of Israel to take part in a Passover festival. He sent messengers to Ephraim and Manasseh inviting them to Jerusalem for the celebration of the Passover. The messengers, however, were not only not listened to, but were even laughed at; only a few men of Asher, Manasseh, and Zebulun came to the city. Nevertheless, the Passover was celebrated with great solemnity and such rejoicing as had not been in Jerusalem since the days of Solomon. Hezekiah is portrayed by the Bible as a great and good king. The Assyrians recorded that Sennacherib lifted his siege of Jerusalem after Hezekiah paid Sennacherib tribute. The Bible records that Hezekiah paid him three hundred talents of silver and thirty of gold as tribute, even sending the doors of the Temple to produce the promised amount, but, even after the payment was made, Sennacherib renewed his assault on Jerusalem. Sennacherib surrounded the city and sent his Rabshakeh to the walls as a messenger. The Rabshakeh addressed the soldiers manning the city wall in Hebrew (Yĕhuwdiyth), asking them to distrust Yahweh and Hezekiah, claiming that Hezekiah's righteous reforms (destroying the idols and High Places) were a sign that the people should not trust their god to be favorably disposed (2 Kings 18:17–35). 2 Kings 19:15 records that Hezekiah went to the Temple and there he prayed to God. Knowing that Jerusalem would eventually be subject to siege, Hezekiah had been preparing for some time by fortifying the walls of the capital, building towers, and constructing a tunnel to bring fresh water to the city from a spring outside its walls. He made at least two major preparations that would help Jerusalem to resist conquest: the construction of the Siloam Tunnel, and construction of the Broad Wall. "When Sennacherib had come, intent on making war against Jerusalem, Hezekiah consulted with his officers about stopping the flow of the springs outside the city … for otherwise, they thought, the King of Assyria would come and find water in abundance" (2 Chronicles 32:2–4). According to the biblical record, Sennacherib sent threatening letters warning Hezekiah that he had not desisted from his determination to take the Judean capital. 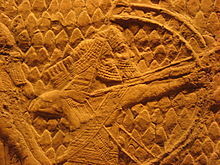 (Isaiah 37:9-20) Although they besieged Jerusalem, the biblical accounts state that the Assyrians did not so much as "shoot an arrow there, ... nor cast up a siege rampart against it", and that God sent out an angel who, in one night, struck down "a hundred and eighty-five thousand in the camp of the Assyrians," sending Sennacherib back "with shame of face to his own land". Sennacherib's inscriptions make no mention of the disaster suffered by his forces. But, as Professor Jack Finegan comments: "In view of the general note of boasting which pervades the inscriptions of the Assyrian kings, ... it is hardly to be expected that Sennacherib would record such a defeat." The Cambridge Bible for Schools and Colleges refers to an "Egyptian tradition, according to which Sennacherib had already reached Pelusium in Egypt, when in a single night his army was rendered helpless by a plague of field-mice which gnawed the bows of the soldiers and the thongs of their shields". 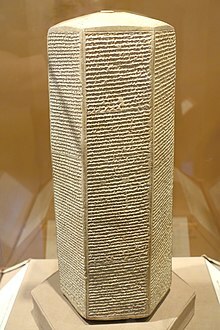 The version of the matter that Sennacherib presents, as found inscribed on what is known as the Sennacherib Prism preserved in the University of Chicago Oriental Institute, in part says: "As to Hezekiah, the Jew, he did not submit to my yoke ... Hezekiah himself ... did send me, later, to Nineveh, my lordly city, together with 30 talents of gold, 800 talents of silver, ..."  This version inflates the number of silver talents sent from 300 to 800; but in other regards it confirms the biblical record and shows that Sennacherib made no claim that he captured Jerusalem. However, Sennacherib presents the matter of Hezekiah's paying tribute as having come after the Assyrian threat of a siege against Jerusalem, whereas the Bible states it was paid before. "It came about as he was worshiping in the house of Nisroch his god, that Adrammelech and Sharezer killed him [Sennacherib] with the sword; and they escaped into the land of Ararat. And Esarhaddon his son became king in his place." According to Assyrian records, Sennacherib was assassinated in 681 BC, twenty years after the 701 BC invasion of Judah. A Neo-Babylonian letter corroborates with the biblical account a sentiment from Sennacherib’s sons to assassinate him, an event Assyriologists have reconstructed as historical. The son Ardi-Mulishi, who is mentioned in the letter as killing anyone who would reveal his conspiracy, successfully murders his father in c. 681 BC, and was most likely the Adrammelech in 2 Kings, though Sharezer is not known elsewhere. Assyriologists posit the murder was motivated because Esarhaddon was chosen as heir to the throne instead of Ardi-Mulishi, the next eldest son. Assyrian and Hebrew biblical history corroborate that Esarhaddon ultimately did succeed the throne. Other Assyriologists assert that Sennacherib was murdered in revenge for his destruction of Babylon, a city sacred to all Mesopotamians, including the Assyrians. Later in his life, Hezekiah was ill with a boil  or an inflammation  which Isaiah initially thought would be fatal. The narrative of his sickness and miraculous recovery is found in 2 Kings 20:1, 2 Chronicles 32:24 and Isaiah 38:1. Various ambassadors came to congratulate him on his recovery, among them from Merodach-baladan, son of the king of Babylon, "for he had heard that Hezekiah had been sick". Hezekiah, his vanity flattered by the visit, showed the Babylonian embassy all the wealth, arms and stores of Jerusalem, revealing too much information to Baladan, king of Babylon (or perhaps boasting about his wealth): he was then confronted by Isaiah, who foretold that a future generation of the people of Judah would be taken as captives to Babylon. Hezekiah was reassured that his own lifetime would see peace and security. According to Isaiah 38:5, Hezekiah lived another 15 years after praying to God. His son and successor, Manasseh, was born during this time: he was 12 years of age when he succeeded Hezekiah. According to the Talmud, the disease came about because of a dispute between him and Isaiah over who should pay whom a visit and over Hezekiah's refusal to marry and have children, although in the end he married Isaiah's daughter. Some Talmudists also considered that it might have come about as a way for Hezekiah to purge his sins or due to his arrogance in assuming his righteousness. Extra-biblical sources do much more for us than give us a pan-Mid Eastern picture into which we contextualize Hezekiah: there are extra-biblical sources that specify Hezekiah by name, along with his reign and influence. "Historiographically, his reign is noteworthy for the convergence of a variety of biblical sources and diverse extrabiblical evidence often bearing on the same events. Significant data concerning Hezekiah appear in the Deuteronomistic History, the Chronicler, Isaiah, Assyrian annals and reliefs, Israelite epigraphy, and, increasingly, stratigraphy". Archaeologist Amihai Mazar calls the tensions between Assyria and Judah "one of the best-documented events of the Iron Age" (172). Hezekiah's story is one of the best to cross-reference with the rest of the Mid Eastern world's historical documents. A seal impression dating back to 727–698 BCE, reading "לחזקיהו [בן] אחז מלך יהדה" "Belonging to Hezekiah [son of] Ahaz king of Judah" was uncovered in a dig at the Ophel in Jerusalem. The impression on this inscription was set in ancient Hebrew script. A lintel inscription, found over the doorway of a tomb, has been ascribed to his secretary, Shebnah (2 Kings 18:18). LMLK stored jars along the border with Assyria "demonstrate careful preparations to counter Sennacherib's likely route of invasion" and show "a notable degree of royal control of towns and cities which would facilitate Hezekiah's destruction of rural sacrificial sites and his centralization of worship in Jerusalem". Evidence suggests they were used throughout his 29-year reign (Grena, 2004, p. 338). There are some Bullae from sealed documents that may have belonged to Hezekiah himself (Grena, 2004, p. 26, Figs. 9 and 10). There are also some that name his servants (ah-vah-deem in Hebrew, ayin-bet-dalet-yod-mem). In 2015 Eilat Mazar discovered a bulla that bears an inscription in ancient Hebrew script that translates as: "Belonging to Hezekiah [son of] Ahaz king of Judah. "This is the first seal impression of an Israelite or Judean king to come to light in a scientific archaeological excavation. Archaeological findings like the Hezekiah seal led scholars to surmise that the ancient Judahite kingdom had a highly developed administrative system. In 2018 Mazar published a report discussing the discovery of a bulla (a type of seal) which she says may have to have belonged to Isaiah. She believes the fragment to have been part of a seal whose complete text might have read "Belonging to Isaiah the prophet." Several other biblical archaeologists, including George Washington University's Christopher Rollston have pointed to the bulla being incomplete, and the present inscription not enough to necessarily refer to the biblical figure. According to the work of archaeologists and philologists, the reign of Hezekiah saw a notable increase in the power of the Judean state. At this time Judah was the strongest nation on the Assyrian-Egyptian frontier. There were increases in literacy and in the production of literary works. The massive construction of the Broad Wall was made during his reign, the city was enlarged to accommodate a large influx, and population increased in Jerusalem up to 25,000, "five times the population under Solomon." Archaeologist Amihai Mazar explains, "Jerusalem was a virtual city-state where the majority of the state's population was concentrated," in comparison to the rest of Judah's cities (167). Archaeologist Israel Finkelstein says, "The key phenomenon—which cannot be explained solely against the background of economic prosperity—was the sudden growth of the population of Jerusalem in particular, and of Judah in general" (153). He says the cause of this growth must be a large influx of Israelites fleeing from the Assyrian destruction of the northern state. It is "[t]he only reasonable way to explain this unprecedented demographic development" (154). This, according to Finkelstein, set the stage for motivations to compile and reconcile Hebrew history into a text at that time (157). Mazar questions this explanation, since, he argues, it is "no more than an educated guess" (167). The Siloam Tunnel was chiseled through 533 meters (1,750 feet) of solid rock in order to provide Jerusalem underground access to the waters of the Gihon Spring or Siloam Pool, which lay outside the city. The Siloam Inscription from the Siloam Tunnel is now in the Istanbul Archaeology Museum. It "commemorates the dramatic moment when the two original teams of tunnelers, digging with picks from opposite ends of the tunnel, met each other" (564). It is "[o]ne of the most important ancient Hebrew inscriptions ever discovered." 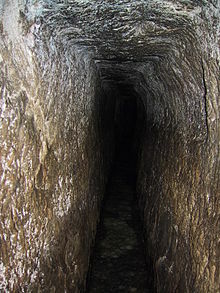 Finkelstein and Mazar cite this tunnel as an example of Jerusalem's impressive state-level power at the time. Archaeologists like William G. Dever have pointed at archaeological evidence for the iconoclasm during the period of Hezekiah's reign. The central cult room of the temple at Arad (a royal Judean fortress) was deliberately and carefully dismantled, "with the altars and massebot" concealed "beneath a Str. 8 plaster floor". 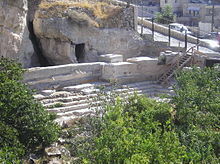 This stratum correlates with the late 8th century; Dever concludes that "the deliberate dismantling of the temple and its replacement by another structure in the days of Hezekiah is an archeological fact. I see no reason for skepticism here." Part of the Lachish Relief, British Museum. Battle scene, showing Assyrian cavalry in action. Above, prisoners are led away. Under Rehoboam, Lachish became the second most important city of the kingdom of Judah. During the revolt of king Hezekiah against Assyria, it was captured by Sennacherib despite determined resistance (see Siege of Lachish). As the Lachish relief attests, Sennacherib began his siege of the city of Lachish in 701 BC. 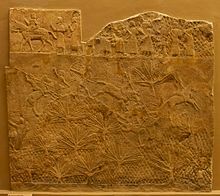 The Lachish Relief graphically depicts the battle, and the defeat of the city, including Assyrian archers marching up a ramp and Judahites pierced through on mounted stakes. "The reliefs on these slabs" discovered in the Assyrian palace at Nineveh "originally formed a single, continuous work, measuring 8 feet ... tall by 80 feet ... long, which wrapped around the room" (559). Visitors "would have been impressed not only by the magnitude of the artwork itself but also by the magnificent strength of the Assyrian war machine." Sennacherib's Prism was found buried in the foundations of the Nineveh palace. It was written in cuneiform, the Mesopotamian form of writing of the day. The prism records the conquest of 46 strong towns  and "uncountable smaller places," along with the siege of Jerusalem where Sennacherib says he just "shut him up...like a bird in a cage," subsequently enforcing a larger tribute upon him. 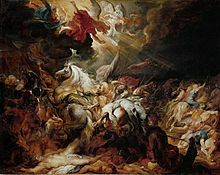 The Hebrew Bible states that during the night, the angel of Jehovah (YHWH Hebrew) brought death to 185,000 Assyrians troops (2 Kings 19:35), forcing the army to abandon the siege, yet it also records a tribute paid to Sennacherib of 300 silver talents following the siege. There is no account of the supernatural event in the prism. Sennacherib's account records his levying of a tribute from Hezekiah, the king of Judea, who was within Jerusalem, leaving the city as the only one intact following the exile of the northern ten-tribe kingdom of Israel due to idolatry. (2 Kings 17:22,23; 2 Kings 18:1-8) Sennacherib recorded a payment of 800 silver talents, which suggests a capitulation to end the siege. However, Inscriptions have been discovered describing Sennacherib’s defeat of the Ethiopian forces. These say: “As to Hezekiah, the Jew, he did not submit to my yoke, I laid siege to 46 of his strong cities . . . and conquered (them) . . . Himself I made a prisoner in Jerusalem, his royal residence, like a bird in a cage.” (Ancient Near Eastern Texts, p. 288) He does not claim to have captured the city. This is consistent with the Bible account of Hezekiah’s revolt against Assyria in the sense that neither account seems to indicate that Sennacherib ever entered or formally captured the city. Sennacherib in this inscription claims that Hezekiah paid for tribute 800 talents of silver, in contrast with the Bible’s 300, however this could be due to boastful exaggeration which was not uncommon amongst kings of the period. Furthermore, the annals[specify] record a list of booty sent from Jerusalem to Nineveh. In the inscription, Sennacherib claims that Hezekiah accepted servitude, and some theorize that Hezekiah remained on his throne as a vassal ruler. The campaign is recorded with differences in the Assyrian records and in the biblical Books of Kings; there is agreement that the Assyrian have a propensity for exaggeration. One theory that takes the biblical view posits that a defeat was caused by "possibly an outbreak of the bubonic plague" (303). Another that this is a composite text which makes use of a 'legendary motif' analogous to that of the Exodus story. Where the 2 Kings account explains giving 300 talents of silver, Sennacherib's prism records 800 talents. "This discrepancy may be the result of differences in the weight of Assyrian and Israelite silver talents, or it may simply be due to the Assyrian propensity for exaggeration" (558). The Talmud (Bava Batra 15a) credits Hezekiah with overseeing the compilation of the biblical books of Isaiah, Proverbs, Song of Songs and Ecclesiastes. According to Jewish tradition, the victory over the Assyrians and Hezekiah's return to health happened at the same time, the first night of Passover. The Greek historian Herodotus (c. 484 BC – c. 425 BC) wrote of the invasion and acknowledges many Assyrian deaths, which he claims were the result of a plague of mice. The Jewish historian Josephus followed the writings of Herodotus. These historians record Sennacherib's failure to take Jerusalem is "uncontested". There has been considerable academic debate about the actual dates of reigns of the Israelite kings. Scholars have endeavored to synchronize the chronology of events referred to in the Hebrew Bible with those derived from other external sources. In the case of Hezekiah, scholars have noted that the apparent inconsistencies are resolved by accepting the evidence that Hezekiah, like his predecessors for four generations in the kings of Judah, had a coregency with his father, and this coregency began in 729 BC. As an example of the reasoning that finds inconsistencies in calculations when coregencies are a priori ruled out, 2 Kings 18:10 dates the fall of Samaria (the Northern Kingdom) to the 6th year of Hezekiah's reign. William F. Albright has dated the fall of the Kingdom of Israel to 721 BC, while E. R. Thiele calculates the date as 723 BC. If Abright's or Thiele's dating are correct, then Hezekiah's reign would begin in either 729 or 727 BC. On the other hand, 18:13 states that Sennacherib invaded Judah in the 14th year of Hezekiah's reign. Dating based on Assyrian records date this invasion to 701 BC, and Hezekiah's reign would therefore begin in 716/715 BC. This dating would be confirmed by the account of Hezekiah's illness in chapter 20, which immediately follows Sennacherib's departure (2 Kings 20). This would date his illness to Hezekiah's 14th year, which is confirmed by Isaiah's statement (2 Kings 20:6) that he will live fifteen more years (29 − 15 = 14). As shown below, these problems are all addressed by scholars who make reference to the ancient Near Eastern practice of coregency. Following the approach of Wellhausen, another set of calculations shows it is probable that Hezekiah did not ascend the throne before 722 BC. By Albright's calculations, Jehu's initial year is 842 BC; and between it and Samaria's destruction the Books of Kings give the total number of the years the kings of Israel ruled as 143 7/12, while for the kings of Judah the number is 165. This discrepancy, amounting in the case of Judah to 45 years (165–120), has been accounted for in various ways; but every one of those theories must allow that Hezekiah's first six years fell before 722 BC. (That Hezekiah began to reign before 722 BC, however, is entirely consistent with the principle that the Ahaz/Hezekiah coregency began in 729 BC.) Nor is it clearly known how old Hezekiah was when called to the throne, although 2 Kings 18:2 states he was twenty-five years of age. His father died at the age of thirty-six (2 Kings 16:2); it is not likely that Ahaz at the age of eleven should have had a son. Hezekiah's own son Manasseh ascended the throne twenty-nine years later, at the age of twelve. This places his birth in the seventeenth year of his father's reign, or gives Hezekiah's age as forty-two, if he was twenty-five at his ascension. It is more probable that Ahaz was twenty-one or twenty-five when Hezekiah was born (and suggesting an error in the text), and that the latter was thirty-two at the birth of his son and successor, Manasseh. In the kingdom of Judah, on the other hand, the nomination of a co-regent was the common procedure, beginning from David who, before his death, elevated his son Solomon to the throne. When taking into account the permanent nature of the co-regency in Judah from the time of Joash, one may dare to conclude that dating the co-regencies accurately is indeed the key for solving the problems of biblical chronology in the eighth century BC." Among the numerous scholars who have recognized the coregency between Ahaz and Hezekiah are Kenneth Kitchen in his various writings, Leslie McFall, and Jack Finegan. McFall, in his 1991 article, argues that if 729 BC (that is, the Judean regnal year beginning in Tishri of 729) is taken as the start of the Ahaz/Hezekiah coregency, and 716/715 BC as the date of the death of Ahaz, then all the extensive chronological data for Hezekiah and his contemporaries in the late eighth century BC are in harmony. Further, McFall found that no textual emendations are required among the numerous dates, reign lengths, and synchronisms given in the Hebrew Testament for this period. In contrast, those who do not accept the Ancient Near Eastern principle of coregencies require multiple emendations of the Scriptural text, and there is no general agreement on which texts should be emended, nor is there any consensus among these scholars on the resultant chronology for the eighth century BC. This is in contrast with the general consensus among those who accept the biblical and near Eastern practice of coregencies that Hezekiah was installed as coregent with his father Ahaz in 729 BC, and the synchronisms of 2 Kings 18 must be measured from that date, whereas the synchronisms to Sennacherib are measured from the sole reign starting in 716/715 BC. The two synchronisms to Hoshea of Israel in 2 Kings 18 are then in exact agreement with the dates of Hoshea's reign that can be determined from Assyrian sources, as is the date of Samaria's fall as stated in 2 Kings 18:10. An analogous situation of two ways of measurement, both equally valid, is encountered in the dates given for Jehoram of Israel, whose first year is synchronized to the 18th year of the sole reign of Jehoshaphat of Judah in 2 Kings 3:1 (853/852 BC), but his reign is also reckoned according to another method as starting in the second year of the coregency of Jehoshaphat and his son Jehoram of Judah (2 Kings 1:17); both methods refer to the same calendrical year. Scholars who accept the principle of coregencies note that abundant evidence for their use is found in the biblical material itself. The agreement of scholarship built on these principles with both biblical and secular texts was such that the Thiele/McFall chronology was accepted as the best chronology for the kingdom period in Jack Finegan's encyclopedic Handbook of Biblical Chronology. ^ "Hezekiah." Encyclopædia Britannica. 2009. Encyclopædia Britannica Online. 12 Nov 2009. ^ John Jarick (22 March 2012). "The Stings in the Tales of the Kings of Judah". In Duncan Burns; John W. Rogerson. Far From Minimal: Celebrating the Work and Influence of Philip R. Davies. Bloomsbury Publishing. p. 232. ISBN 978-0-567-31337-9. ^ a b c "Hezekiah". Jewish Encyclopedia. Retrieved 15 April 2012. ^ a b "Sennacherib and Jerusalem". ^ a b c d e f g h i j k Archaeological Study Bible. Grand Rapids: Zondervan, 2005. Print. ^ Georges Roux. Ancient Iraq. ^ a b c d e "Hezekiah." The Anchor Bible Dictionary. 1992. Print. ^ ben Zion, Ilan (2 December 2015). ""לחזקיהו [בן] אחז מלך יהדה" "Belonging to Hezekiah [son of] Ahaz king of Judah"". Times of Israel. Retrieved 2 December 2015. ^ Heilpern, Will. "King Hezekiah's seal discovered in Jerusalem - CNN". CNN. Retrieved 14 March 2018. ^ "Impression of King Hezekiah's Royal Seal Discovered in Ophel Excavations South of Temple Mount in Jerusalem | האוניברסיטה העברית בירושלים | The Hebrew University of Jerusalem". new.huji.ac.il. Retrieved 2018-03-14. ^ Fridman, Julia (14 March 2018). "Hezekiah Seal Proves Ancient Jerusalem Was a Major Judahite Capital". Retrieved 14 March 2018 – via Haaretz. ^ Mazar, Eliat (1 February 2018). "Is This the Prophet Isaiah's Signature?". Biblical Archaeology Review. 44 (2): 64–69. Retrieved 14 March 2018. This seal impression of Isaiah, therefore, is unique, and questions still remain about what it actually says. However, the close relationship between Isaiah and King Hezekiah, as described in the Bible, and the fact the bulla was found next to one bearing the name of Hezekiah seem to leave open the possibility that, despite the difficulties presented by the bulla’s damaged area, this may have been a seal impression of Isaiah the prophet, adviser to King Hezekiah. ^ "2018 February". www.rollstonepigraphy.com. Retrieved 2018-02-27. ^ Dever, William G. (2005) Did God Have a Wife? : Archaeology and Folk Religion in Ancient Israel (Eerdmans), pp. 174, 175. ^ a b "Hezekiah." The Family Bible Encyclopedia. 1972. Print. ^ James B. Pritchard, ed., Ancient Near Eastern Texts Related to the Old Testament (Princeton, NJ: Princeton University Press, 1965) 287–288. ^ Grabbe 2003, p. 308-309. ^ Zondervan Handbook to the Bible. Grand Rapids: Lion Publishing, 1999. ^ a b c Harris, Stephen L. Understanding the Bible. 8th ed. New York: McGraw-Hill, 2011. ^ Edwin R. Thiele, The Mysterious Numbers of the Hebrew Kings (3rd ed. ; Grand Rapids, MI: Zondervan/Kregel, 1983) pp. 134, 217. ^ William J. Murnane, Ancient Egyptian Coregencies (Chicago: The Oriental Institute, 1977). ^ J. D. Douglas, ed., New Bible Dictionary (Grand Rapids, MI: Eerdmans, 1965) p. 1160. ^ Nadav Na'aman, "Historical and Chronological Notes on the Kingdoms of Israel and Judah in the Eighth Century BC" Vetus Testamentum 36 (1986) p. 91. ^ See Kitchen's chronology in New Bible Dictionary p. 220. ^ Leslie McFall, "Translation Guide" p.42. ^ Jack Finegan, Handbook of Biblical Chronology (rev. ed. ; Peabody MA: Hendrickson, 1998) p. 246. ^ Leslie McFall, "Translation Guide" pp. 4–45 (Link). ^ Thiele, Mysterious Numbers chapter 3, "Coregencies and Rival Reigns." ^ Jack Finegan, Handbook of Biblical Chronology p. 246. Wikimedia Commons has media related to Hezekiah. Herbermann, Charles, ed. (1913). "Ezechias" . Catholic Encyclopedia. New York: Robert Appleton Company.